In this article we cover a number of SCD food delivery services offering Specific Carbohydrate Diet and GAPS diet legal meals and baked goods, services I wish I had known about when first starting out on the diet. Many of these companies also deliver nationwide, so more people than ever have this option regardless of where you live. These services should also work for those on the GAPS diet who are looking for GAPS diet food delivery options, at least once you progress past some of the early intro diet stages. Several of the national delivery companies also offer homemade bone broths and soup stocks, which could be a great time saver even for someone starting the GAPS or SCD intro diets. I had to dedicate a lot of my time and energy to figuring out the logistics of cooking these new foods, while waiting to see if my health would improve. Now years later, I can honestly say all that time and effort was well worth it for me. But having the option of take a week off of cooking and ordering from these services would have been awesome to know was an option. This post contains affiliate links. Thanks for your support! Click here to learn what this means. The first group I’ll mention are food delivery services that claim to specifically cater to the SCD and GAPS diets. As you can see there are only a couple, and they are small food delivery businesses that only deliver to one particular metro area. This is a wonderful option to explore if you happen to live in one of these cities – for the rest of us you’ll want to check out the next section. This restaurant in Portland was funded by a kickstarter campaign in 2012. Since then they have expanded to both a restaurant, multiple food carts and a delivery service throughout the Portland area. Their tag line is “love your belly” and they specifically mention their meal delivery services “very first customer was AIP, SCD, and low FODMaP! Don’t worry about it.” and that they know it’s hard to be on an “elimination diet, and we’re happy to specialize in those too!” (on their inquiry form for the meal delivery service they have a checkbox for Paleo, GAPS, low FODMAP, AIP as well as many other autoimmune protocols). 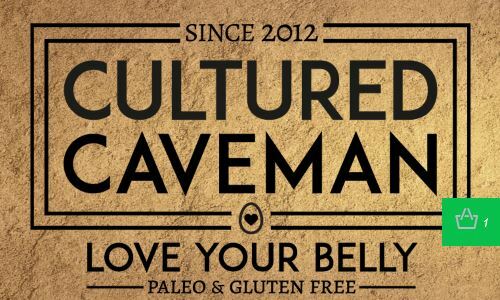 Cultured caveman commits to listing all ingredients on their Paleo friendly restaurant menu, and most items are SCD and GAPS friendly even on the standard menu without customizations. Feed Your Vitality is a chef meal delivery service that is local to the St. Louis Missouri area. They offer a line of “Anti Inflamatory/Paleo” meals which specifically can be tailored to a number of medical and autoimmune protocols. The great news is they list SCD and GAPS in their list of diets they cater to. This said, in looking at their stated list of ingredients they cook with, they tend to be Paleo compliant by default, but not 100% SCD or GAPS, so be sure to work with them to ensure they are customizing your meal plan to your needs and the particular stage you are at with SCD/GAPS. They offer meals to be picked up weekly at several St. Louis area locations or they can arrange delivery to your home for those who are unable to pick up meals at these locations. Despite the great fortune of those who happen to live in cities with a dedicated SCD restaurant or SCD delivery service. To cover the largest number of people possible, I next wanted to write about an option that is viable for practically everyone, regardless of where you live. In my research I have yet to find a company that specialized specifically in only SCD meals as opposed to focusing on SCD baked goods (the closest would be Back on Tract covered below). UPDATE: there is now one dedicated SCD meal delivery company offering frozen SCD meals geared specifically for children like SCD chicken nuggets, see Caleb’s Cooking Company below. To give some more detail on the scope of these limitations, the CCFA is planning to contract with a company named Real Food Works for an upcoming study on the SCD diet (for adults) to create SCD meal plans, but Real Food Works does not appear to be offering SCD meal plans to the public outside of the study. Luckily, there are in fact a number of companies that offer SCD and even GAPS diet compliant meals that you can order and get delivered to your door, if you know where to look. 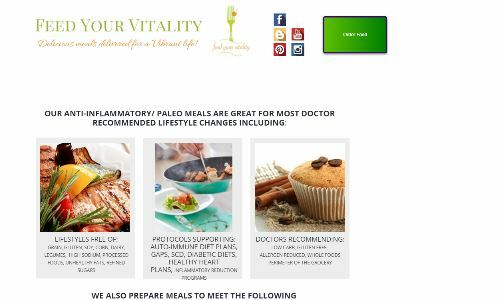 Given the popularity explosion of the Paleo diet over the last several years, there have been a good number of meal delivery companies that have started to specialize in meals for the grain free, sugar free, dairy free Paleo diet. Although each company is different, a number of these companies have focused on serving those people on the Paleo diet with strict dietary requirements for autoimmune conditions, needing healthy meals made from scratch with local high quality oils made from whole vegetables and fruit, unprocessed meat and wild caught fish and seafood. Given that a strict Paleo diet tends to also avoid almost everything on the SCD diet illegal list, this means that the majority of meals you are able to order from these companies are fully SCD compliant. Further with these companies being so careful to disclose all of their ingredients used in each meal, it also makes it easy to pick out the meals that are fully SCD and GAPS compliant and skip any that have Paleo ingredients not allowed on SCD/GAPS like sweet potatoes. 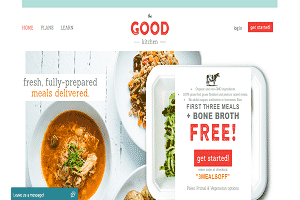 The Good Kitchen, based out of North Carolina but shipping nationwide, is likely a good option for those looking for SCD and GAPS compliant meals, especially people looking for meals with a more mature/healthy entree focus. All meal plans allow you to pick and choose the meals that work for you, so if you decide just one of the meals fits your dietary requirements, you can order 5+ of those meals (meal plans start at 5 meals and all offer free shipping). Most importantly, they disclose the ingredients for each meal, so you can quickly figure out which ones will work for you and order just those. There can be non-SCD legal ingredients included in their meals on occasion, especially things like sweet potatoes as they do have a lot of customers doing the Paleo diet, but if you take a look through their menu you will likely find a number of meals that would work for you. You can pick out meals that do fit your dietary requirements and SCD/GAPS stage by looking at the ingredients and just ordering those particular meals. One thing that has been great for me is that they offer meals that are both Vegetarian, plus SCD compliant via their vegetable based meal line. This has been amazing for me personally as someone who is both strict SCD and a Pescatarian/Vegetarian. I still need to pick out the ones that use only SCD legal ingredients but luckily they tend to have a meal that is both SCD compliant and vegetarian every couple weeks when their menu changes and I just stock up and order a lot of the meals at once, throwing them in my freezer for future weeks. If you have questions about ingredients used in any of the meals or possible substitutions I’d encourage you to reach out to their customer service team (I have done this in the past for several of the meals to confirm ingredients, additives, etc). Website: See thegoodkitchen.com (they recently rebranded from modPALEO to The Good Kitchen) for their complete menu, list of ingredients and meal prices. Website: See www.paleoonthego.com for a complete menu, list of ingredients and meal prices. 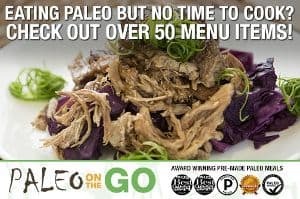 Paleo on the Go has offered a 10% off coupon code for readers of this blog: use “MYPALEOS” at checkout for 10% off your entire order – one time use. 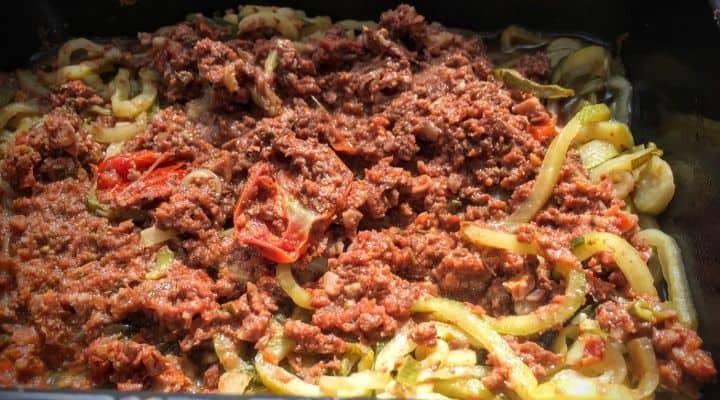 Pete’s meals are made with organic, seasonal and local produce grown from small farms in their area in Southern California and are delivered non-frozen via express overnight delivery. Compared to the companies listed above Pete’s tends to stick with simple preparations, with minimal ingredients and no sweeteners, so in theory a good option for those looking for SCD and Gaps legal meals. Unfortunately, they sell their meals in weekly plans, rather than letting you order individual meals and do not disclose all the ingredients in the meal plans via their website, just a general description of each meal. 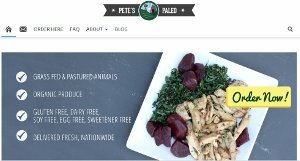 If you’d like to work with Pete’s while on SCD/GAPS you will likely need to email their customer support to confirm the ingredients in this weeks meal plan and ask if you can subsitute any meals that you cannot eat. Pete’s is otherwise very strict in their adherence to Paleo requirements, so you should only need to look for items that are allowed on Paleo that are not allowed on SCD and GAPS, such as sweet potatoes. Pre-Made Paleo has an extensive menu with a lot of different types of meals, many of which are SCD and GAPS compliant. Unfortunately, they also sell the majority of their products and meals through meal plans, but unlike Pete’s, they give a detailed breakdown of each ingredient in each meal of their different meal plans. One option would be to pick out the meals you can eat and then ask for substitutions of those meals you can’t eat within a given plan. Except for a new fresh plan, Pre-Made Paleo ships their meals frozen, which allows them to cover the greatest delivery area of all of the companies listed, offering delivery throughout all 50 US States (including HI and AK), Puerto Rico and Canada. For more info on Pre-Made Paleo’s plans, including how to receive a discount for our readers on your order see our in-depth write up on Pre-Made Paleo. Pre Made Paleo is offering a 5% discount off your entire order for readers of this blog – enter the discount code “MYPALEOS2018” at checkout. 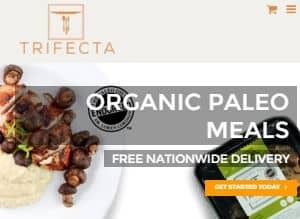 Trifecta also offers Paleo meals via weekly meal plans, where some meals will be SCD legal and some will not (you would again have to inquire with customer service to confirm individual meal ingredients). Trifecta commits to offering 100% Organic ingredients in all of their meals. 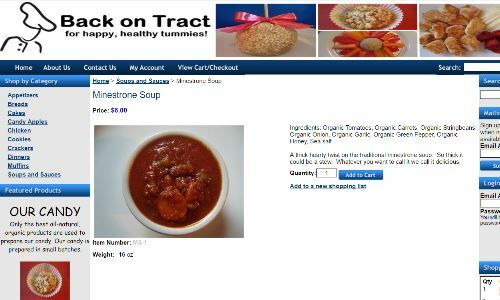 One unique offering from Trifecta that might interest some people on the SCD diet or GAPS diet are their bulk offerings. Originally created for those doing intense training such as weighlifters and atheletes, foods within their bulk offering are simply cooked and seasoned with salt and pepper. Although a bit plain, they are a way to have high quality organic, free range pre-cooked meats, wild seafood and organic vegetables delivered to you that can be re-heated and even further seasoned to your liking. Probably not the best option for everyone but might interest some, especially people who have trouble sourcing these types of ingredients in their area (the prices for the bulk items can compare to the cost of simply buying high quality organic in-season produce and grass fed meats in some locales). Another option to think about if you live in one of the below listed cities are personal chefs who tailor a meal plan to the Specific Carbohydrate Diet. If you are lucky enough to live in one of these cities and can afford the often slightly higher prices of custom tailored chef services versus more standard food delivery, these can be a great option. Especially in the intro phases of the SCD and GAPS diets where the allowed ingredients are so limited. Washington DC – Note: a friend of mine (see instagram profile for contact info) offers baked goods to those with dietary restrictions in the DC/MD/VA area, just contact her with your requirements and she’ll try to customize an order based on your dietary needs. Caleb’s Cooking Company was launched with a Kickstarter campaign to raise money and awareness about their mission: create SCD prepared meals designed for kids and to help connect kids with IBD on the SCD diet. They are the only 100% SCD focused frozen meal company that I am aware of – but in addition, they are the only grain/gluten free meal delivery service focusing 100% on kids meals. They originally set up shop as a meal delivery service, but recently had to scale back/transform their business model into selling freezer meals in health food stores and more traditional grocery markets (starting with their home market of the Washington DC metro area and branching out from there). They have also scaled back their menu line to focusing primarily on grain free chicken nuggets in multiple flavors. Some other cool things about the company: they were started by a 14 year old boy to help other kids with IBD, they have hired the chef from the research studies on the SCD Diet at the Seattle Children’s Hospital as the creator of the original recipes for their meal line. I also like that they operate out of Union Kitchen, a commercial kitchen project in a redeveloping neighborhood in Washington DC (where I also live). Website: See https://calebscookingcompany.com for their SCD kids meals. In addition to SCD and GAPS food delivery, one of the first types of businesses that started popping up to service those on the SCD diet are specialty bakeries. This makes sense as baked goods are some of the most time consuming items to prepare on these diets and the foods that are furthest from what you might make in your everyday life. Below are some of the companies that are currently operating and selling SCD legal baked goods and other related SCD products. Several of the owners of these bakeries have family members or are themselves on the SCD diet for health reasons and therefore know a lot about the dietary requirements. Along the lines of meal delivery, a few of these companies offer things beyond SCD cookies toward meal items like SCD breads and even pre-made SCD pizza crusts. Several do deliver, but the delivery options tend to be more limited and less ironed out than the Paleo meal delivery companies mentioned above. In addition to having SCD food for sale some of these companies also act as a general SCD food store, selling honey sticks and some other pre-packaged items. Started by a family in Massachussets after gaining experience baking and cooking SCD legal foods for their nephew and then grandson who was on the diet, Back on Tract/Duke’s Bakery is a gluten free, casein free, soy free, sugar free bakery offering baked items in-house as well for delivery. In addition to baked items such as SCD cookies and breads, they also offer a handful of SCD entrees, sauces, soups and dips for delivery. Most ingredients used are organic. More recently, the couple started a brick and morter restaurant, Duke’s Bakery and Variety, as well, serving those in the Falls River, MA area. The Duke Bakery menu offers both SCD and non-SCD items for families eating together. Website: https://www.facebook.com/dukesbakery/ (they no longer maintain websites and just use their Facebook page) Note: I recently confirmed with the owner they they still ship both food and baked goods to people around the country but that shipping costs will be the responsibility of the person ordering and can be high depending on where you live in the U.S. – if you are interested call them at 1-508-837-0624 to discuss your order. 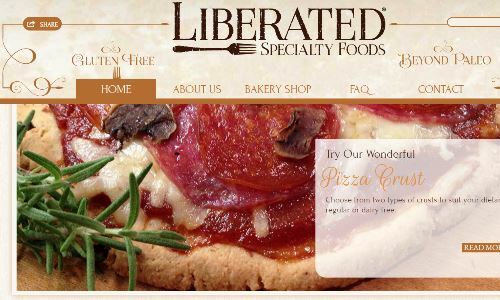 A SCD friendly bakery based in Alabama started by a mother who follows the SCD diet for her family, specifically for her daughter who has celiacs and psoriasis. The majority of baked items follow SCD principles and even includes more unusual bakery items such as SCD pizza crusts and SCD breads and SCD crackers. The bakery ships to different states – use the checkout feature to see if your address qualifies. 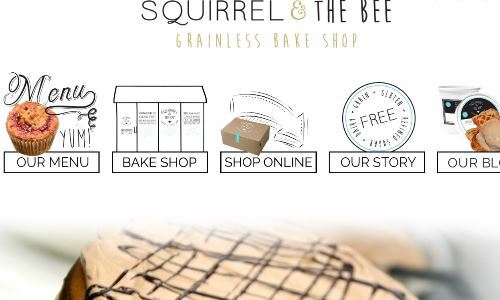 Squirrel and the Bee in Short Hills NJ was started by a professional Pastry Chef Michelle Retik, after healing herself from UC following on a grain free SCD-like diet. They offer express shipping of baked goods to all 48 continental U.S. states with plans to add shipping to HI, AK and internationally in the future. All items are marked with symbols designating if that item follows SCD, Paleo, Vegan, Dairy Free and Gluten Free requirements. In addition to the bakery, they also run a cafe offering a selection of SCD cafe items and SCD meals for lunch and breakfast at their location in New Jersey. They offer a number of specialty SCD cakes as well that can be custom ordered for special occasions. 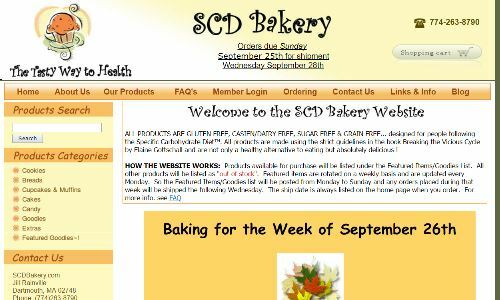 As one of the first services created for people following the Specific Carbohydrate Diet, and certainly one of the first mail order bakeries offering SCD items, the SCD Bakery has been consistently serving those in the SCD community for many years from their location in Dartmouth Mass. Each week, they offer a rotating selection of SCD cookies, sweet SCD breads and other grain free treats. Items can be shipped (I have ordered from DC) although you will want to confirm with the company that they ship to your particular address, depending on the state/area that you live. 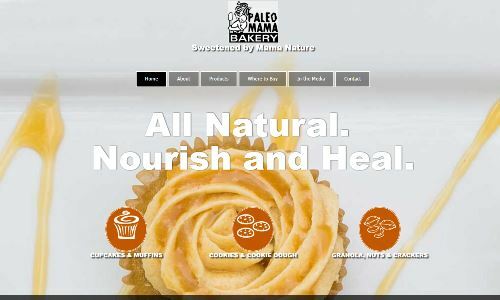 The Paleo Mama bakery was started by Belle Pleva, who has followed the SCD diet to heal her Crohn’s Disease. Based in Madison Wisconsin, they offer a number of SCD baked goods and SCD friendly snacks, which are sweetened with honey and are grain free and in most cases dairy free. Given the emphasis on serving the Paleo community as well, some items do contain organic cocoa, but are easy to spot. Above and beyond picking up items at the bakery and local health food stores in Wisconsin, they will ship their SCD cookies, SCD candied pecans, SCD crackers and SCD granolas outside of the immediate area. Wellbee’s – As noted by a reader, Wellbee’s has a relatively large selection of SCD baked goods like grain free breads, SCD friendly pizza crusts, and a pretty wide array of different SCD friendly muffins. This is in addition to their online store selling curated SCD legal grocery products. Based out of Monsey, NY, they also offer some pretty extensive shipping options, such as all over the US for frozen baked goods and even international shipping available for some packaged goods. At one point, I did work with a personal chef in my area for a bit of time when my health was at it’s worst. Since I couldn’t find a chef that catered to those on the SCD diet, the person I chose had no prior experience cooking for those on a special health related diet for autoimmune disease. I had to outline all the rules of the SCD when deciding on a list of meals. Unfortunately on several occasions SCD illegal ingredients did creep in to the meals, despite my best efforts. I only found out about after the fact when looking at the grocery shopping list charges. Working with a service that was aware of the importance of avoiding products containing trace amount of sugar and other unallowable ingredients would have been a huge time saver for me as well as a lot less stressful. Luckily, at least in the case of the nationwide delivery services mentioned in this article, at a minimum ingredients details are disclosed for each meal, so you know this information up front before ordering. Since these companies are big enough to have a dedicated customer service team you can get your questions answered about a particular component before ordering a meal, something that I have taken advantage of several times recently to ask about the details of a particular ingredient used. I’m so happy to have learned about the companies listed in this article. Although I have tried out several of the Paleo meal delivery services, picking out SCD friendly meals, there were other companies I only found out about doing the research for this article. I am excited to give them a try. Reading the stories of these individual businesses, I can’t help but hope they continue to thrive. This is our community and these businesses are designed to make our lives living on autoimmune diets more practical and more enjoyable. So I’m happy to support these companies in any way I can. I hope you feel the same way too. Do you know of another great company offering SCD food delivery or GAPS diet food delivery in your area or nationally? Please share! Let everyone know in the comments below. I’ll do my best to continue to update this guide as well and get your suggestions added.